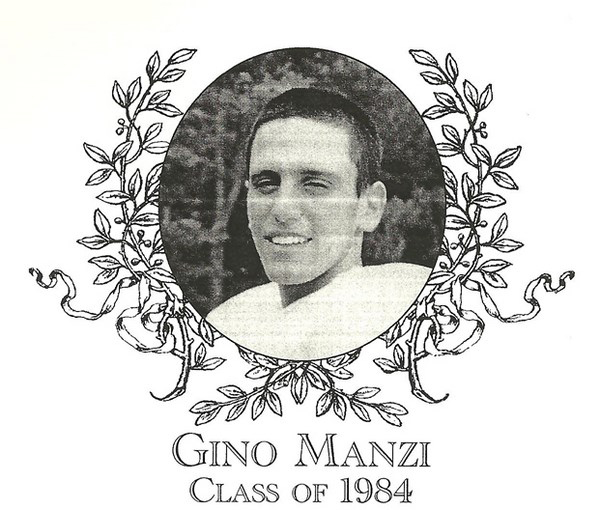 Attaining success in Bartlett High School athletics seemed to come easy to Gino Manzi, Class of 1984. Although he was only a member of the football squad his senior year, Gino�s talent was made evident through his individual achievements and season highlights. A two-way starter for the entire season, he scored nine touchdowns and had a record setting eleven interceptions. He was the recipient of the Thanksgiving Day MVP Sabatinelli award; a Border Conference All-Star; and was named to the T&G Super Team. Two of the football highlights standout � the game changing touchdown put return versus Shepherd Hill and the game saving interception at the end of the Turkey Day Classic. Gino�s primary sport was basketball. He was a three-year starter who went on to accomplish some amazing individual feats and established a number of season and all-time Bartlett school records. During his sophomore and junior years, he was the team leading scorer and assist leader. In addition, he was the team�s MVP for both seasons. In 1982, Gino recorded forty-nine straight free throws over a seven game period. In his senior year, he was elected captain and led the team both in scoring and steals. His 29.7 points per game ranked second in all of Central Mass. Gino was selected as a Border Conference All-Star in basketball for all three years and was named a Division II All-Star in 1983. In 1984, the T&G named him captain of their Super Team and he also received recognition from USA Today as honorable mention All-American. Gino tallied 1,328 points, thus breaking the all-time career point total head at the time. He currently holds the record for Bartlett�s all-time highest career scoring average (29.7 ppg) and scored more than 40 points in a game six times. While attending Nichols College, Gino continued his stellar play averaging 22 points per game and established a Nichols single game scoring record of 47 points. Gino went on to successfully coach Boys Varsity Basketball at both Southbridge and Shepherd Hill high schools, winning six conference championships in the process. Gino has worked in the insurance industry for the past sixteen years and resides in Dudley with his wife Melissa and two daughters, Kayla (15) and Talia (11).